3 Bedroom End of Terrace House For Sale in Warwick for Asking Price £325,000. Do not miss this fantastic development opportunity! Offered with NO CHAIN and PLANNING PERMISSION GRANTED. 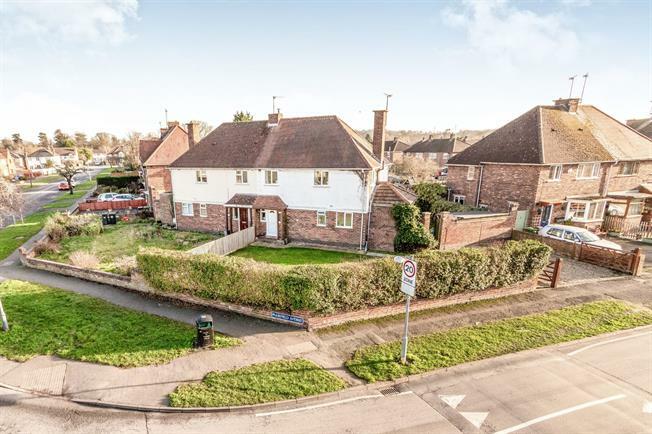 This three bedroom 1950's semi detached property has planning for a second dwelling. The plans include a two bedroom end of terraced property briefly comprising of, open plan kitchen living space, downstairs w/c, two bedrooms and a family bathroom. The current property is well maintained throughout and at ground floor level, comprises; a good sized lounge, kitchen diner and generous utility space. At first floor level, there are two double bedrooms, a single bedroom and a family bathroom. Exposed brick feature fireplace. Double glazed uPVC window overlooking the front garden. Solid oak flooring. Radiator and ceiling light. A range of wall and base units with granite effect work surfaces over, inset stainless steel one and a half bowl sink with mixer tap and drainer, integrated oven and hob with overhead extractor. Tiled floor and part tiled walls. Full length glass uPVC framed door and spotlights. Base units with granite effect work surface over, space for washer dryer and dishwasher. Useful storage cupboard and separate cupboard for boiler. Tiled flooring and part tiled walls. Double glazed uPVC window facing the front garden and full length double glazed door to the side of the property. Ceiling lights. Low level WC, pedestal sink. Tiled flooring. Spotlights. Double bedroom with double glazed uPVC window facing the rear of the house. Feature fireplace. Ceiling light. Three piece suite with low level WC, pedestal sink and panelled bath with overhead shower. Tiled flooring and tiled walls. Double glazed uPVC window. Radiator and ceiling light. Double bedrooms with built in wardrobe. Double glazed uPVC window facing the rear overlooking the garden. Radiator and ceiling light. Single bedrooms with double glazed uPVC window. Radiator and ceiling light. Spacious front garden mainly laid to lawn with mature hedges creating a private boundary. Block paved pathway leading to the property from a gravelled driveway, currently allowing space to park for two cars. Plans proposed to incorporate a drop curb and four car parking spaces, two per property. Generous garden, laid mainly to lawn with block paved patio area. Proposed plans include diving the current garden and including side access into the new dwelling.